Last week, I continued our Positive Money Mindset talk by sharing with you a portion of my 2-hour digital workshop, Creating & Living a Life That You Love, to help you create a financial vision that will guide you when you set financial goals. You can read/watch it again here. This week, I’m sharing with you a few tips from my goal setting process to enhance this process even more. 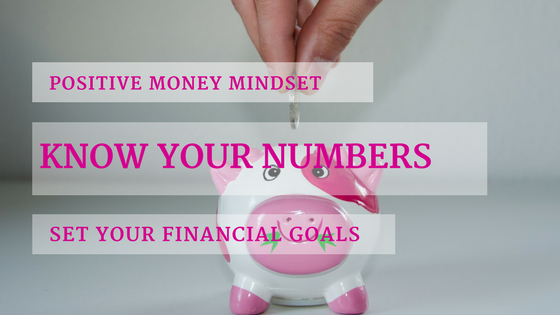 The first step to setting your money goals is to actually know what your current numbers are. I have attached a worksheet below to help guide you. Knowing your numbers is powerful. We must take control of our finances and not be afraid to look at our bank accounts. If it isn’t the way you like it, let’s work on a plan to make it better. I used to hate looking at my accounts and credit card statements. But the thing is, even if I don’t look, it doesn’t change the reality. Now I have total control of what comes in and what goes out, which puts me in the power seat. I also have a clear picture of where I stand. If I haven’t reached my monthly savings goal, I don’t wait until the end of the month to look at it. I know by week 2 where I stand and I can make the necessary adjustments. Once you know your numbers, you can head back to the vision exercise from last week and figure out what you need to make it happen and set some goals. Goal setting, or as I call it desire setting has always worked for me. Not necessicarliy because of the goal, but because of where my attention is going. “where your attention goes, your energy flows.” Our thoughts become things. If you continue to think something over and over and over again, it will absolutely manifest itself. Not magically with a wand, but because the actions or inactions that we take will be based on our thoughts and our beliefs. Money is no different. Here are some steps to help you set Contagiously Positive goals. You can read Monday’s post as well if you haven’t yet. It is related to setting heart-centred goals. You have created the idea of what you want (your vision), now pull out one thing that you can create a goal for. For example, it could be that you want to pay off a $5000 credit care balance or save $3000 to go on a trip to Mexico. Break it down into baby steps. For example, looking at just the final amount of $5000 can feel overwhelming. So instead, look at it month by month. Now that you know your numbers, how much do you have available every single month to put against your credit card. List out all the baby step payments that you can make. Set a specific, realistic, I can definitely achieve this by this date timeline. Once you have step #2 complete, what is the end date of paying off your credit card bill? If you are going to put $400 a month to pay it off, how long will it take? Don’t forget to include the month interest. If you realize in month 1 that the monthly payment isn’t working for you, break it down even smaller. People give up their goal because they become overwhelmed. The timeline is only there to motivate and inspire you. It shouldn’t cause anxiety and stress. So whether it take 5 months, 7 months or 10 months, that doesn’t matter as long as you are moving forward. Another example is; say you have an additional $100 a month that you can set aside. It would take 10 months to save $3000 for that trip. That 10 month date out is your timeline. But your monthly savings is also your timeline. Everything is broken down into baby steps in order to take away the feeling of overwhelm. Is extremely important. Why do you want? How will it make you feel? Not just when you achieve it, but now today, in this moment. This is essential. Everything goal we set, every desire we want, is because we think it will make us feel good. That is human nature. So, before you write down a goal and start taking action, make sure that you really, really want it. Make sure it is a YES! I would do anything to achieve it! That is a goal that is infused with passion. That is what inspires you to take action. Not willpower, but passion, desire, I want it. What is the feeling you are working towards achieving? If you need extra cash to achieve your goals, think about ways you can bring in extra money. I truly believe that you can do whatever you set your mind to. The power to Create & live a life that you love is, was and always will be yours. I would love to hear from you. If you want to take the conversation further, private message me by replying to this message.